3 Commonwealth is located on the north side of Commonwealth, between Arlington and Berkeley, with 1 Commonwealth (12 Arlington) to the east and 5 Commonwealth to the west. 3 Commonwealth was built ca. 1861, one of a pair of academic brick houses (3-5 Commonwealth) built at the same time in a symmetrical design, each with a bay extending through the mansard roof. 3 Commonwealth was built on a lot with a 50 foot frontage, and 5 Commonwealth on a lot with an 80 foot frontage. The houses were about the same width, with 5 Commonwealth slightly larger and the western portion of the lot – about 20 feet wide — left open. Both houses included stables at the rear of the property. 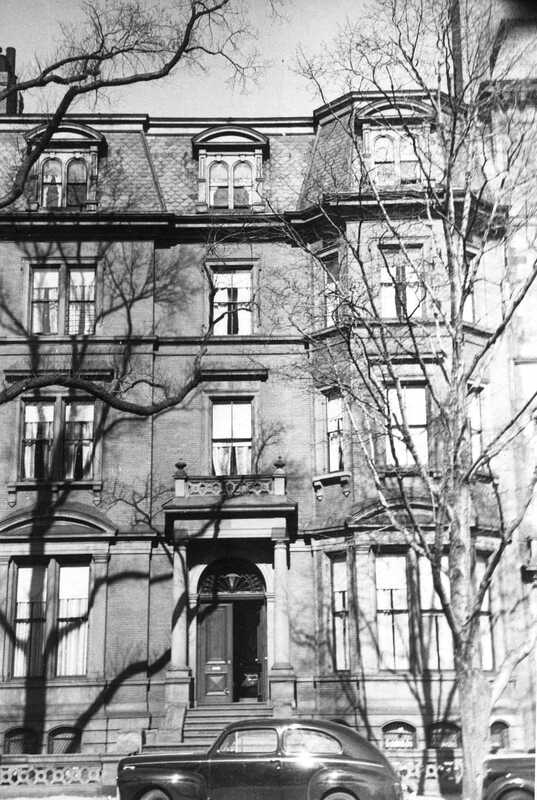 3 Commonwealth was built as the home of Benjamin Smith Rotch and his wife Annie Bigelow (Lawrence) Rotch. 5 Commonwealth was built for his brother-in-law and his wife, Abbott and Harriette (Paige) Lawrence. 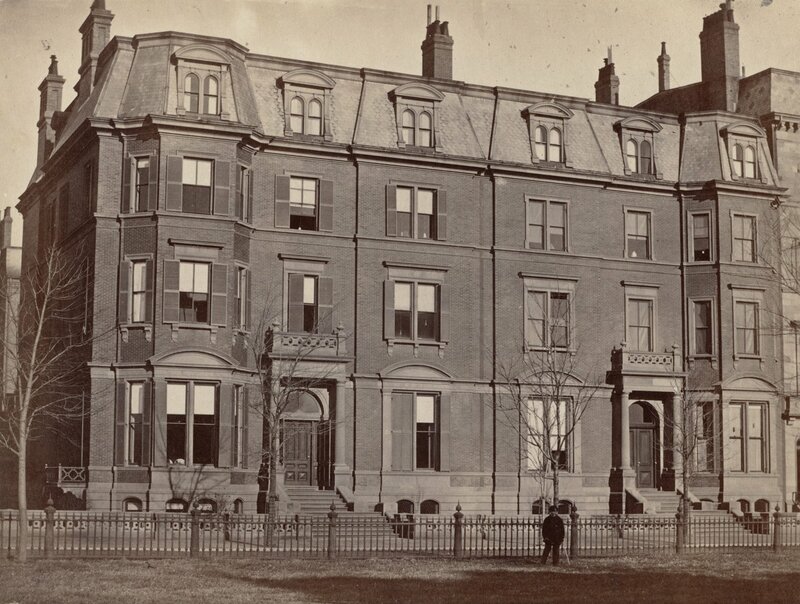 Both men purchased the land on which the houses were built from the Commonwealth of Massachusetts on May 2, 1860. The Rotches previously had lived at 66 Boylston. Click here for an index to the deeds for 3 Commonwealth. Benjamin Rotch was a merchant and founder of the New Bedford Cordage Company. He also was an accomplished landscape artist. He died in August of 1882. After his death, his children (who included architect Arthur Rotch) established and endowed the Rotch Travelling Fellowship of the Boston Society of Architects, which provided grants to young architects, enabling them to travel in Europe and further their knowledge of the field. Annie Rotch continued to live at 3 Commonwealth. Her unmarried sons, architect Arthur Rotch and professor of meteorology Abbott Lawrence Rotch lived with her. Annie Rotch died in August of 1893. Arthur Rotch had married in November of 1892 to Lisette de Wolf Colt and moved to 82 Commonwealth, and Abbott Lawrence Rotch married in November of 1893 to Margaret Randolph Anderson, and by 1895 was living at 265 Commonwealth. 3 Commonwealth was not listed in the 1894 and 1895 Blue Books. On November 27, 1894, 3 Commonwealth was purchased from the Rotch family by Louisa (Norton) Bullard, the wife of William Story Bullard. They previously had lived at 5 Mt. Vernon. William Bullard and his brother, Stephen H. Bullard, were partners with Henry Lee, Jr., in the shipping merchant firm of Bullard, Lee & Co.
William Bullard died in August of 1897. Louisa Bullard continued to live at 3 Commonwealth with her unmarried daughter, Katherine Eliot Bullard (born Catharine Norton Bullard), and her husband’s niece, Ellen Twistleton Bullard (daughter of Stephen Bullard). Louisa Bullard died in September of 1915, and Katherine and Ellen Bullard moved soon thereafter to 39 Commonwealth. On May 17, 1916, 3 Commonwealth was purchased from the Bullard family by John Stanley Ames. 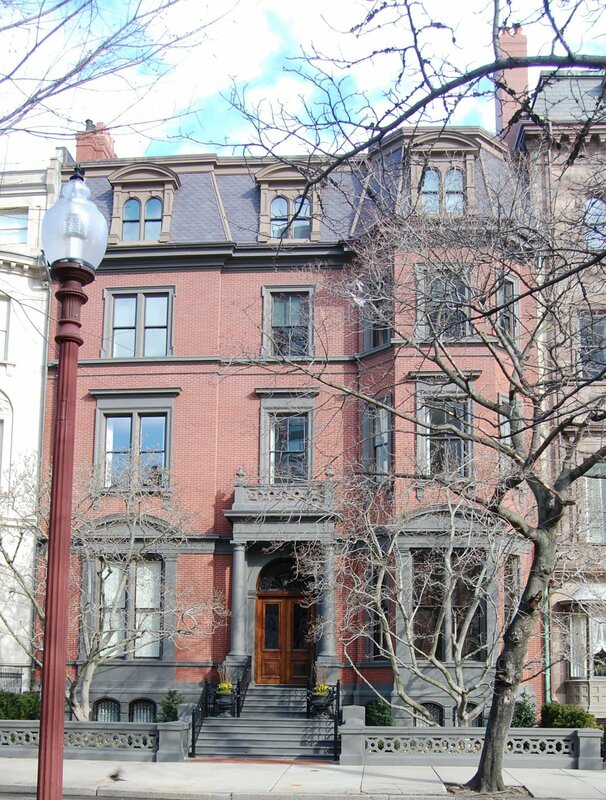 He and his wife Anna (Nancy) McKinley (Filley) Ames, made it their Boston home. They previously had lived at his family home at 306 Dartmouth. They also maintained a home, Langwater, in North Easton, that had been built for his parents, Frederick Lothrop Ames and Rebecca (Blair) Ames. John Stanley Ames’s family had founded the Ames Shovel Company in North Easton and later became major investors in the Union Pacific and other railroads. John Ames was a trustee of his family’s investments and bank director, and a noted horticulturalist. In June of 1916, he applied for (and subsequently received) permission to remodel the house, including adding a two-story brick addition at the rear, 22 feet wide and 14 feet deep. The work was designed by architects Little and Browne. Plans for the remodeling and addition, including detailed drawings of various interior features, are included in Historic New England’s Arthur Little and Herbert W. C. Browne Architectural Collection. In about 1929, John Ames’s sister, Mary Shreve (Ames) Frothingham, the widow of Louis Adams Frothingham, made 7 Commonwealth her home. John and Nancy Ames continued to live at 3 Commonwealth and in North Easton until his death in June of 1959. In his will, John S. Ames left 3 Commonwealth to the Unitarian Society of North Easton. His son, businessman and state legislator Oliver Filley Ames, decided to keep the home and on April 26, 1960, he purchased it from his father’s estate with the consent of the church. 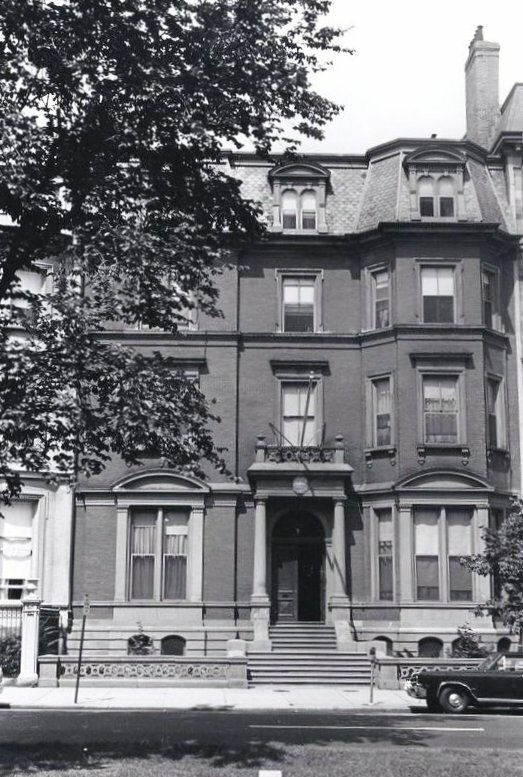 By 1961, he had leased it to the French Consulate; it previously had been located at 178 Beacon. The consulate moved in 1995 and on March 27,1996, Oliver Ames sold the house to Modern Continental Enterprises, Inc. Modern Continental applied for (and subsequently received) permission to convert the property into six units, including constructing a 20′ x 22′ structure in the rear connecting the house with the existing garage. 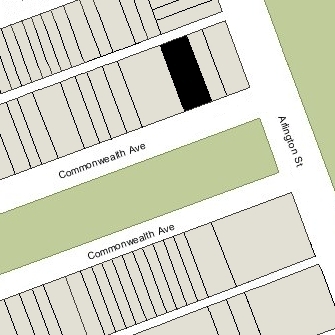 On June 8, 1997, Modern Continental converted 3 Commonwealth into five condominium units with a garage accommodating up to seven vehicles: The Residences at Three Commonwealth Avenue. In May of 1998, Modern Continental applied for (and subsequently received) permission to reduce the number of units from six to five, conforming the legal use to the actual number of units built.